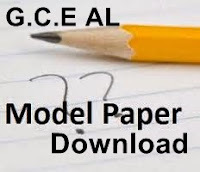 The National e-learning portal for the general education (e thaklsalawa) conducted by Ministry of Higher Education Sri Lanka has shared the G.C.E (A/L) Government Model Papers for those who plan to sit Advanced Level. this is a great work from Ministry of Higher Education Sri Lanka and this will definitely helpful to enhance the marks of Advanced Level in Sri Lanka. Following are several model papers in Advanced Level Business Studies Sinhala and English Medium with answers. Right Click and save target as to download the relevant model paper pdf file for your computer.